Mayashop is one of the most popular flexible responsive e-commerce themes ever built! Mayashop will work with any Wordpress site and wields the power of JigoShop and WooCommerce. With shortcodes and widgets, Mayashop allows you to easily modify the content and layout of your Wordpress site with the ability to choose any color and over 50 custom backgrounds. Mayashop is built to be your sales weapon! With thousands of positive reviews and excellent support, you simply cannot go wrong with the Mayashop Wordpress Theme. If you don't believe me, read the theme reviews for yourself! 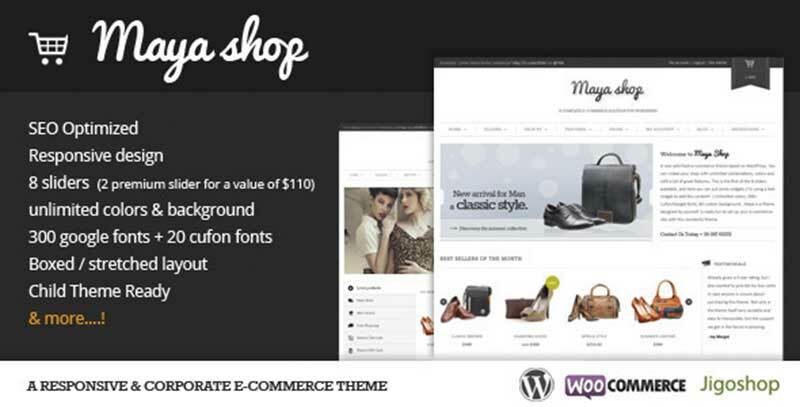 Click here to download the Mayashop Theme now.